scratch replied to Percy's topic in I.C.E. Could also be a wheel bearing, I had this in a 2000 Forester, wheel wasn't wobbly but one side of the bearing was turning on the hub. If you can get to the back of your stereo, there's acc power there, yellow wire if i remember right, red is permanent on. The reason I think there's always power at the map lights is that its the negative that's switched, someone will be able to confirm. I can understand them cracking down on modifications to low beam because of the required beam pattern. I thought you could have anything for high beam as long as it can be dipped? Or have I missed the point? Wof isn't due till September so I'll cross that bridge when I come to it. Yeah full conversion, warm up is 15+ seconds which is a little long. I think it may be because its a cheap kit, as the factory bulbs (low beam) warm up in seconds. I've got some LED's coming, if anyone is interested i can post how they go. Has anyone got LED high beam bulbs? aftermarket I mean. I recently tried HID in my highbeam, while the light output is awesome, what kills it for me is the warm up time. I want to get LED but haven't got the funds to buy to try. 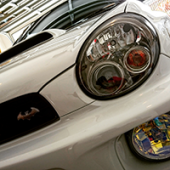 Car is 2008 Impreza S-G/T with factory HID low beam and HB3 fitting highbeam. scratch replied to Gripless's topic in I.C.E. I've got one kicking around that I used in a sh5 Forester, if you want it. Don't run turbo subaru's on 91 EVER. I bought a twin turbo Legacy that had been run on 91 and it had killed the A/F sensor and knock sensor. I've got a '08 S-GT manual, I always drive in 3rd in town unless the engine is fully warmed up. If you're just cruising you can have the rpms as low as you like, just if you need power you'll have to change down (obviously). As for boosting, it depends on the situation how much you rev it before changes. Hopefully this is helpful, stupid questions are fine - just watch out for stupid answers. Sorry, clarification: Front wiper blade de-icer, not much use in nz.